An adorable shaggy dog named Teddy started Annie on a mission to help raise awareness about heartworm disease. 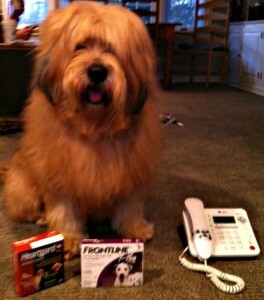 Houston Shaggy Dog Rescue rescued Teddy from a high-kill shelter in Houston, TX. Annie and her family adopted two year old Teddy only to find that he had been diagnosed with heartworm disease for which Teddy had to go through a long, painful treatment process. When Annie learned that heartworm disease is easily preventable with simple once-a-month heartworm prevention medication, she decided to do her best to help educate others and spread the word about preventing heartworm disease. Annie started a non-profit organization called Wags 4 Hope, and helps educate others about heartworm prevention through articles, flyers, speaking engagements and other special events. Her heartworm disease flyer has been distributed in all 50 states through dog-friendly universities and corporations – important, because heartworm disease has been found in every state in the US. Annie also uses her love of painting to help animals; she creates paintings of dogs which she sells and then donates the proceeds to shelters across the country to help cover medical expenses for animals waiting to be adopted. Last October Annie sold 50 paintings at a special event for the Pet Animal Welfare Society (PAWS) in Norwalk, CT.